Deborah Voigt has sung in the world’s most famous opera houses, playing lead roles in the works of Wagner, Strauss, Verdi. Yet, in 2004 she made headlines for her size, not her voice. London’s Royal Opera House dismissed Voigt for being too large to fit into her character’s costume – a little black dress. Shortly after that, Voigt underwent gastric bypass surgery. The pounds fell off, but she soon replaced her addiction to food with other destructive behaviors. Now, Voigt has written a revealing memoir in which she discusses her successes and challenges – and offers a backstage peek into life behind the velvet curtain. Deborah Voigt Opera singer and co-creator of "Voigt Lessons," a one woman show. Excerpted from “Call Me Debbie: True Confessions of a Down-to-Earth Diva,” © 2015 by Deborah Voigt. Reprinted with permission from Harper Collins. All Rights Reserved. Deborah Voigt and Bryn Terfel perform in the opening of Act II of Wagner’s “Die Walküre” at the Metropolitan Opera. MS. DIANE REHMThanks for joining us. I'm Diane Rehm. The unapproachable diva is an enduring image in the world of opera. It's an image Deborah Voigt hopes to shatter in her new memoir, "Call Me Debbie: True Confessions Of The Down-To-Earth Diva." She tells the story of her struggles with weight, addiction and self esteem. Even as Voigt rose to international prominence, singing with the likes of Luciano Pavarotti and Placido Domingo, she battled offstage demons that almost cost her her career. MS. DIANE REHMShe's here with me to talk about her music, her life and what it means to be a down-to-earth diva. You are welcome to join us, 800-433-8850. Send your email to drshow@wamu.org. Follow us on Facebook or send us a tweet. And welcome to you, Deborah Voigt. MS. DEBORAH VOIGTThank you. It's so nice to be with you, Diane. REHMWell, lovely to meet you in person. I gather that you were actually singing before you were even talking. VOIGTI think you may be right, at least if the family lore is correct. I began singing as a very, very small girl. My mother sang in our church choir so singing was in the house, but certainly not with the ambition that I seemed to have, even at a young age. REHMHow did your father react to your singing? REHMOf which he did not approve. VOIGTNo, he did not really approve, although, that being said, I think he really thought that I was going to use my voice in church and in church only. The idea that I might become a theater woman or a trollop of the stage, I think, was a very off-putting one to him. REHMSo considering that, that was in your head, my father doesn't like this. It's sort of against church rules, religious upbringing. Why did you decide to pursue it? VOIGTBecause I have felt and known from a very young age that that is what I'm supposed to do. I am supposed to be a singer that it ended up being opera was a bit random, to a certain extent, but from the very beginning, I knew I had a voice. I knew that when I sang, I elicited a response from an audience that I could communicate a message, whether it be religious in church or whether it be musicals or opera. And that always felt very much second nature to me. REHMI love the fact that you felt that God spoke directly to you. VOIGTI did. And I had an experience that I talk about in the book very early on where I felt very strongly that I had been communicated to from God that I am supposed to sing. And I didn't talk about that experience for about 10 years after the time that it happened and didn't speak about it again until I wrote the book. And I think it's very interesting that, for whatever reason, I felt that I couldn't or shouldn't and I think that may have something to do with certain people's perceived ideas about religion. VOIGTIf I say that I'm someone who believes in the Bible, that I believe in God or in Jesus that people have these ideas. Well, that, then, must mean that you don't think that your gay friends should be married or that you don't think a woman should have choice and that certainly is not where I come from. VOIGTWhen I had this experience, right. REHM...spoke to you. Could you not say that to your father? VOIGTI probably could have, but it was so surprising to me that I doubted it for quite a while and so kept it to myself. REHMWell, I'm glad you've written about it. You end up at Cal State Fullerton studying voice and your teacher, Jane Paul, really provided you with not only wonderful instruction, but a safe place to be. VOIGTAbsolutely. She understood me from the minute I walked into her studio. She understood my emotional life. She understood my insecurities. She understood my voice. She had sung the same repertoire as a young singer that I was beginning to explore so we had that in common as well. And she was just a great lady. She was a wonderful musician. She taught me a lot about being a singer, about interacting with colleagues, about sharing my experience with an audience and that if I thought it didn't go well, that didn't mean that they didn't think it wasn't fantastic and that I should -- or that they did think it was fantastic and that I should, you know, keep my negativity to myself when I interacted with them. REHMThat's hard to separate, isn't it? Your own sense of how it goes and what you think the audience may feel. VOIGTThat's true. And it is maybe a part of that pride thing that I grew up with, don't have too much pride in what you're doing. And so maybe I felt I had to knock down my performance, whether it was really good or not. But I think, too, that singers are perfectionists, like many other people. I'm sure you are as well. And so you will never think that the performance is 100 percent what it should be. REHMQuite right. Quite right. What was the first time on stage for you like? VOIGTWell, I don't know that I really remember. An operatic stage, I think that it was daunting from the very beginning. But at the same time, I took a lot of pride of my own of the fact that I could be onstage and have a wonderful experience when everything is lined up. The stars, the universe. I think it's a thrilling experience when those things are in order, when you're singing well, when you're communicating with your partner on stage, when you feel the audience is right there in the palm of your hand. That's a really special and exciting experience. REHMDo you remember performing in Richard Strauss "Ariadne Auf Naxos"? VOIGTI do. I remember, in particular, the first time that I sang through the part with my pianist. I was just beginning to study it and I sang through it with him and I looked over at him and he had tears in his eyes and I knew we were onto something. REHMLet's hear a clip of that. REHMThis actually became one of your signature roles. Why do you think? VOIGTWell, I think that I had a voice that naturally lended itself to Strauss, very long, arching phrases that require an enormous amount of breath support. That came naturally to me. I had a quality that Strauss required in his singing, a femininity, a vulnerability and it all sort of worked. And he writes incredibly beautiful roles for women, in particular. And so I was very lucky to be able to sing his music. REHMDid you identify with her? VOIGTI did. She's a woman who's been abandoned on an island and she's yearning for the return of her tenor, in this case, Bacchus. And I think that I always was yearning for that man in my life from the time I was very young and still do, still waiting on that island for my Bacchus to show up. REHMYou also say that this role allowed you to show your humor and really lampoon the diva caricature. VOIGTThat's true. The prologue to -- or the (word?) to Ariadne, I'm playing a prima Dona, a very temperamental one, throwing fits and that's great fun to play because it's not really my character, but my character is to have fun. REHMShort break here and when we come back, your calls, your comments for opera singer Deborah Voigt. REHMAnd welcome back. Deborah Voigt is here in the studio with me. She's an internationally acclaimed opera singer who appears regularly as both performer and host of the Metropolitan Opera's, The Met, "Life in HD" series. She's also the co-creator of the voice -- "Voight Lessons," and that's a one-woman show that's going to have its premier later this month. Tell me about that. VOIGTWell, it began with a conversation between myself and Francesca Zambello -- who is, of course, the general director, general manager of Washington National Opera -- about recitals and how difficult it is to program recitals anymore. The art of the recital seems to be dying, unfortunately. And so, in discussing how we might bring a little vitality to this particular genre, she said, I think you need to create a one-woman show. Okay, well that might be interesting. She said, I think we need to have a writer. I think we should approach Terrence McNally. I thought, Terrence McNally, of "Master Class" fame, he's not going to want to write a show for Debbie Voigt. Well, he did. VOIGT...my experiences, and we called it "Voigt Lessons." VOIGTIt'll be February 26 at the 92nd Street Y on the upper east side of Manhattan. REHMWill it be recorded and televised, perhaps? VOIGTNot -- no, not yet. I could have had it potentially recorded to be televised. But I want to get out there and do it. REHMYeah. And see what it feels like. VOIGTFeels like, but what it feels like, it's a very intimate show. And I would like to perform it a little bit before it's televised. REHM...so I shall. Aside from your beautiful voice, you also became known for your size. REHMTell us about your struggle with weight. VOIGT...young children, trying to get them to eat. On the other hand, he was very aware of my mother's eating and then subsequently mine, in that, he didn't want us to have weight problems. Maybe he felt it reflected on him. Maybe he just wanted me to be healthy. So don't have another cookie, Debbie. Do you really need that? But at the same time, clear your -- clean your plate. So it was very confusing. By the time I got to be -- the end of high school, I was beginning to gain weight, and certainly in my early 20's, I began to use food as a way to sort of anesthetize myself to a certain extent. And my weight grew and grew and grew and grew, until I was really morbidly obese. VOIGTThere's a difference between a young woman walking out on stage who is just big boned, who has a certain amount of weight on her that might serve her well as an opera singer, and someone who is a poster child for obesity. And, unfortunately, that's where my weight took me. REHMSo how did that weight affect your voice? VOIGTI think, in the beginning of my career, it served me almost well, in that, I would take a breath and all that poundage would automatically engage my abdominal muscles and the sound would just go flying out of my mouth. Here I am and it -- I just didn't have to work at it. But I began to feel that I was losing breath walking, that my knees were starting to hurt me and I was just tired of being trapped in that body. I had done everything I could to lose weight. And I finally thought, this is -- I've had enough. I also knew that opera was becoming more visually oriented and that if I was going to propel my career onto the next phase, I had to be more viably interesting in these roles. REHMNow, tell us about the black dress -- the little black dress. VOIGTThe little black dress, yes. Well, I was engaged to sing Ariadne, who we've just heard some music from, at the Royal Opera House in London. I had already performed there twice, so they knew who they had hired. It wasn't a secret that Deborah Voigt's a big woman. And I was probably the first choice Ariadne in the world at that time, if I may be so bold. I had the contract to sing. It was fully executed. And suddenly I got a phone call saying, there's a problem with you and the costume for this particular production. Can't we change the costume? No, we can't change the costume. VOIGTI don't know. That's the decision that they made. I think, had they had it to do over again, they probably would have changed the costume. Nonetheless, it wasn't the first time that I'd heard, you're not going to work in a production because you're too big. So my manager said, okay. Then what other production will you bring her into? And there was nothing. VOIGTWe said, then, okay, then, a concert to make up for this cancelled engagement. No concert. That was the problem. REHMDebbie, how big were you at the time? VOIGTI was big. I was weighing probably about 320 pounds at that time. REHMAnd you were still able to sing, even though your breath was somewhat more shallow. VOIGTI -- when I say that my breath was becoming shallow, I didn't -- I don't mean on the opera stage. I mean walking around. VOIGTNo problem. There was nothing going on vocally that was a problem. REHMDid you ever see the costume they had in mind for you? VOIGTYes. Because when I finally did lose the weight, I went back. And I sang that role on that stage. And we fashioned a costume that worked well for me then. So I'm not sure why they couldn't have done it to begin with. REHMHow did you ultimately lose the weight? VOIGTI had gastric bypass surgery. I had tried everything else, even what had been called the gastric bubble, which was -- at the time, they inserted a bubble into your stomach, they blew it up through your esophagus and it was -- the idea was to -- much like the gastric bypass -- fill up your stomach so that you felt full all the time. And it only worked for maybe 15 pounds and it -- that was it. So I knew that I had to take drastic means to lose the weight. And I finally decided to go ahead and have gastric bypass surgery. REHMHow much weight did you lose as a result? That doesn't happen automatically. REHMBut then the discipline to keep that weight off. VOIGTYeah, because it's not a cure. VOIGTAnd ultimately, I mean, I -- right now, I'm putting the same 10 pounds on and off, I think I've done it maybe five times in the last year. So you do have to come to terms with your eating. I could balloon myself right back up if I sat around and only ate Snickers bars. So I don't. REHMAnd -- but then you had trouble with other addictions as well, even having gone through this radical surgery and losing all this weight. VOIGTWell, that's true. Because there were still emotional issues. There were reasons that I was eating. And many, women in particular, who have gastric bypass find themselves in an addiction to alcohol, in particular, because we haven't solved what makes us so unhappy. VOIGTThe -- right. You know, why does Debbie Voigt feel so uncomfortable in her skin? What is that about? And if you don't feel comfortable in your skin, you try not to feel anything. And so it went from food to a small period of men and bad relationships, ultimately, to alcohol abuse. REHMI've seen a photograph of you in the book in your wedding dress. REHMTell me about that marriage. VOIGTWell, I met the man who would become my husband when I was about 16. REHMHe's not identified in that photograph. VOIGTYeah, he is. Yeah, it says -- I think, if I'm looking at the same one. No, maybe you're right. VOIGTMaybe you're right, I'm not sure. REHMI was surprised at that. REHMYou are clear. But he is not identified. VOIGTYeah. He's talked about -- he's talked about in the book. VOIGTYeah, I'm a big old bride there, aren't I? Yeah. And I decided that, I think that Prince Charles and Diane got married around the same time or before, and so I was influenced by her bridal gown choices, which were not flattering on a 300-pound woman. That looked like a lot of taffeta and tulle. REHMAnd how long were you married? VOIGTI was only married to him for seven years. But I didn't date anyone else or have any other relationships from the time I was 16 until I ultimately left him. REHMSo once the alcohol addiction began, what happened to your career, to your life? VOIGTWell, I think that I nipped it in the bud just in time, in terms of initially trying to deal with my alcoholism. But I would finish a show and I couldn't wait to get home to have a drink. I walked in the door. I didn't take my coat off. I poured myself a big glass of wine. I never drank on the day of a performance. I never went on stage intoxicated. But my life was getting smaller and smaller and smaller. VOIGTBecause I wasn't -- I was isolating myself all the time. I wasn't interacting with people. I was just showing up to do my job and that's all I was doing. And that's not much of a life. It got to the point where I was in yet another bad relationship. He broke up with me on Valentine's Day. And I had a very, very bad, scary bottom, in which I had a blackout that lasted, as long as I can figure, maybe about 36 hours and was very scary. VOIGTAnd I thought that -- I mean, I got sober at that time. I was involved in the 12-step program and thought that I had beaten it. And I hadn't. It spun wildly out of control again. And I finally put myself into rehab because I knew that this was not going to go away and it never will. I mean I know that now. But I had to get professional help. REHMHow long were you in rehab? VOIGTThis particular center was a 31-day program. They would have liked for me to have stayed longer, I'm sure. But I knew that I needed to get back to work, that I needed to learn how to work and be a sober person and do what I had to do to take care of myself. REHMThat must have been so hard. VOIGTIt was really hard. I -- the admission that I am powerless over this was very, very difficult. I had been a very driven woman. I had been able to do everything that I thought I wanted to do professionally. And this thing was bigger than me and so I had to take very drastic steps. REHMDeborah Voigt, her new book is titled, "Call Me Debbie: True Confessions of a Down-to-Earth Diva." And you're listening to "The Diane Rehm Show." We've got lots of callers, Debbie. So let's open the phones. 800-433-8850. Let's go first to Oklahoma City. Leslie, you're on the air. LESLIEGood morning, Diane. Can you hear me? LESLIEAnd I'm getting my makeup on to go to work while I'm listening. You know, I just had to call in. Ms. Voigt, I just want to tell you how much I'm impressed with what you've been through and how you've come back. I am also a trained opera singer, jazz singer, performer and 54 years old. And I've been through many ups and downs. And I'm just so impressed with your strength and that you've come back from what you have and that you're willing to talk about it. I wanted to comment that we opera singers are -- one of the things that makes us so amazing -- we're great singers to begin with -- is that we do tap into the emotions and feelings of others. But it also makes us so vulnerable to so many things. LESLIELearning how to protect ourselves and not be hurt and now allow that to spill into our own lives is a real challenge. And I think that so many of us suffer from many of the similar problems that Debbie has. LESLIEI see it. And I know about it. But what you said about your first teacher really struck a chord with me of how, from the moment you walked in, she knew and understood you and understood who you were and accepted you. And that is such a crucial thing for someone who is going to start on the path of singing. REHMAbsolutely. And by the way, if you're just joining us, you can watch live video of our show. Go to drshow.org. I must say, I'm sitting here thinking about that little black dress episode. I wonder how angry you were? VOIGTI was pretty angry. As I said, not because they didn't think I was appropriate for this production, but that they couldn't and wouldn't find something else. I mean, I volunteered to do an orchestral concert. And the fact that they were making the statement that they didn't want me, that really, really hurt and made me very angry -- probably more hurt than angry. VOIGTIt's very, yes, you're right. VOIGTThey're very near one another in terms of emotions, aren't they? VOIGTNo. No. No, no, they didn't. VOIGT...and the man who's the head of the theater -- I was there for a couple of days before he finally came and said hello to me. And he said, you know, I have a whole file, a couple inches thick, of letters that he had received saying, you know, how could he do this and that it was just a terrible thing to do. And one of them was even framed on the wall in his office, full of expletives. VOIGTSo I think, had he to do it over again -- you know, they never thought it would become a public discussion. And it did because I did a -- I was doing -- going back to London to do a recital and was doing press. And one of the journalists said, when are you coming back to sing at the Royal Opera House? And I thought, oh, well what am I going to say? They haven't invited me? That hurt my ego and wasn't true. So I said, well, I think we're having a hard time coming up with a project. There was a possibility of my doing something and it fell through. Why did it fall through? And I told the truth. And I said, well, there was a discrepancy about my costume. REHMGood for you. Short break. We'll be right back. VOIGTThank you. That was Zeglenda (sp?) from Deval Kura (sp? ), one of the first plognarian (sp?) roles that I came to be acknowledged for singing quite well. But I took that role on for the first time opposite Placido Domingo. And I think that probably every woman sings well opposite Placido Domingo. Quite an experience to put it mildly. VOIGTAnd the voice. But he's really a great man too, a great guy. You know, he really doesn't come in airs about him. He gets into the rehearsals just as much as anybody else, and it's really a wonderful experience. REHMSuch a range as well. VOIGTThank you. Yeah, I was enjoying that, hearing how wonderful my low notes sound. REHMBut what did you do in response to those critics? How did that affect you? VOIGTYou know, I stopped reading reviews a long, long, long time ago. You really only have a short amount of time, which I call the honeymoon period, with these critics. The first few times they hear you, you're wonderful. And then they start to criticize. It's the natural progression of a career. I would hear, you know, things, that, you know, this wasn't a great review or -- and not even so much a great review as the voice has changed, the voice has changed. Okay, I can't focus on that. I can only do what I think's best. If I walk off the stage and I think it's been a good performance, then I'm happy. If the audience responds, well, I'm happy. That's really for me what it's all about, is getting a good reaction from the public. REHMAll right. Let's go to Richard in Lafayette, Ind. You're on the air. RICHARDI had a question for Debra concerning substance abuse. I as well struggle from something like that, and I didn't know if there was something at a primal level that you tap into to overcome, because I've been running -- you know, had the problem for years and can't find, you know, suffer from (unintelligible) to get over it. And I didn't know if there was maybe over -- or simplified explanation or something you can tap into. VOIGTI think that there's no explanation for any of it. And the key is that you have to get sick and tired of feeling sick and tired. And when you get to that point, you will find yourself the help that you need. I have found that I benefit with being involved in a 12-step program, because I have to acknowledge that this thing is bigger than I am. And until you do and humble yourself, it's probably going to be a battle for you all the time. It's a very simple thing. You have to find a power greater than yourself. And if you really want that kind of help, you have to surrender to it. You have to say, okay, I don't have the tools to do this on my own. And you'll stop fighting it, stop trying to control it yourself. REHMLet's go to Jonesboro, Ark. Kelly, you're on the air. KELLYHello, Diane. How are you this morning? KELLY...and the recovery process after that. I know it's not as simple a surgery as people feel that it is. And I guess that rolls over into, I wonder if you may have rushed to try to get back on stage. And coming from a theater background myself, I wonder if the theater for you is an addiction as well as some of the other things that have been in your life. VOIGTWell, I think probably theater is an addiction and probably maybe one of the few healthy ones. And I don't think you even have to be on the stage to feel addicted to theater. The recovery for gastric bypass is not complicated if you have an uncomplicated procedure. What is complicated is learning how to eat appropriately with your new stomach. You just have to eat very slowly. They tell you not to drink liquids for a half an hour before you eat. And so really it's not a complicated process. REHMHow do you think it changed your voice and your manner of singing more than your voice? VOIGT...that I would have to think about the engaging of these muscles more than I had to at my highest weight. And the process of learning to sing with this new body did take longer than I thought it would. Now, your caller asked did I rush onto the stage too soon. I'm a professional singer, so I had to get back on that stage as quickly as I could. I didn't have the leisure of taking a year off to lose the weight and go through the process of relearning how to use my voice. REHMOn the other hand, some concert pianists take a year off. What's different? VOIGTWell, maybe I'm addicted to the stage. REHMUh huh. That's a great answer. All right. Let's go to Patricia in Winchester, Va. You're on the air. PATRICIAHi, Diane. I have such great respect for both of you women. PATRICIAI'm thrilled you took my call. Having been fortunate enough to have a 20 year solo career in opera, I know that my favorite roles were those that allowed me to die on stage. Just hearing the audience cry and whimper, you knew that you were reaching them, and that was such a great feeling. And then of course to get up and get a check for it, you know, was a bonus. VOIGTYou're absolutely right, Diane (sic). Dying on stage is a lot of fun, certainly better than dying in life. REHMYeah, that's for sure. Go ahead, Patricia. PATRICIAIt's the best. It's just the best. My question is, what are your type of favorite roles? Do you prefer, you know, a lighter role if there is such in Wagner (sp?) ? Or do you prefer those really -- I know you do many dramatic roles. Do you prefer dying on stage? VOIGTWell, I don't know if I necessarily need to die, but I definitely need a lady who has a very rich emotional life, because that gives me something to play with on stage. And I try to find what in the characters I can see myself, identify with. One of the roles that I love to play is Salome, and you would say, well, Salome's supposed to be a 16-year-old princess. You certainly aren't a 16-year-old princess. But I can certainly see myself being frustrated as a 16-year-old, not getting the guy that I want, not getting from my parents what I want. I can relate to that. VOIGTAnd out comes the head of John the Baptist on a silver platter. VOIGTOh, she's a lot of fun to sing that one. REHMThat is exciting. And you're listening to "The Diane Rehm Show." That was from Richard Strauss from the 2004 album "Obsessions." 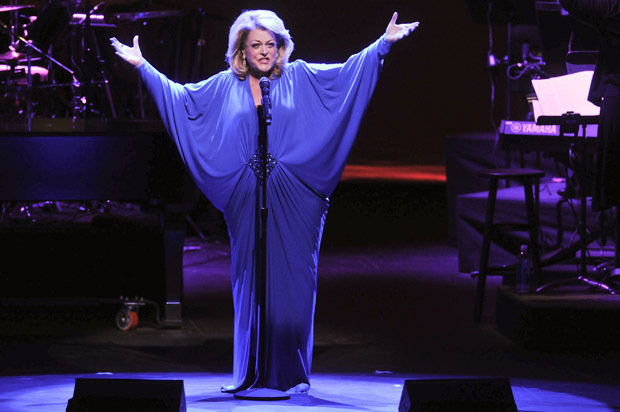 Deborah Voigt singing "Salome" in that final scene. Oh, my gosh. VOIGTIt's a wonderful one. Really is. I've been very, very lucky to sing some incredibly wonderful roles. REHMLots of people want to know about the languages you have to learn and how you do that. VOIGTWell, we don't have to learn. We have to learn phonetics. We have to learn how to translate certainly. My German's not bad. My Italian is not so great. VOIGTOh, yes. And we do all our homework, so we know what is being said to us and what we're saying. But, yeah, that's certainly a big part of it. There's a lot of study being an opera singer. VOIGTOh, the memorization has always been the worst part for me, even as a child. VOIGTOh, yes. I quite piano lessons because I had to memorize one of the movements of the Moonlight Sonata for a piano competition. And I just couldn't do it. I just -- I could not do it. It's always been the most difficult thing for me. REHMBut have you got cue cards beneath the stage for you to rely on? VOIGTNo. We have prompters. So we have a person who sits in a little box on the stage and they give us the words. I have been known to write a word or two on my hand, I admit it. The sneaky parts. REHMDeborah Voigt, what a pleasure to talk with you. VOIGTAnd to talk with you. Thank you so much for having me. REHMWell, it's been a great pleasure. I think we'll go out with Richard Wagner from, again, the 2004 album "Obsessions," this from "Tristan and Isolde."